So far, so good. Still loving our new home and cooking up a storm. Three large windows keep the kitchen well-lit and lots of counter space (something I haven’t had in years) makes it conducive to kitchen wizardry. I started off by cooking Julia Child’s Beef Burgundy. Worth every minute! Next I chose a Pinterest recipe for Baked Cod and made a lemon-reduction sauce with capers rather than using the called for lemon juice. Then I made my first pot of Carne Guisada, the Mexican version of beef stew. Delicioso! I’m now officially in love with my Dutch Oven. The crockpot may find itself on a Goodwill shelf soon. Another of our favorite things is the gluten-free ginger cookies I made on Friday. They were delightful: ginger forward (even though it is dried ginger, not fresh), crispy, light and sugar crystal crunchy. I have another batch in the works as I write this. 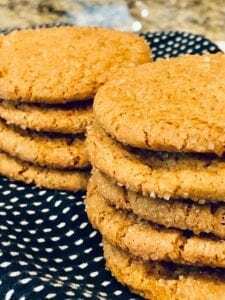 You need to make no apology that these Ginger Cookies are wheat-free. In fact, I’d never even mention it, or if I did, I’d brag! Years ago when I was first diagnosed, Gluten Free Goddess was one of the very first bloggers I found who were posting about wheat-free cooking and offering gluten-free recipes. She candidly wrote about her struggles with chronic illnesses, her dairy issues and celiac disease. With food intolerances, it’s often wheat AND dairy. Or wheat AND other grains, or wheat AND eggs. This can make baking extremely difficult, but she does it well. As I said in my book, when it comes to auto-immune disorders, they “travel in packs.” You don’t get just one, but often, related groups. Food intolerances seem to be the same. I felt awful for what she was going through, much worse than what I was dealing with… and grateful that she was an experienced chef, a knowledgeable writer and offered treats I could eat. This recipe is from Gluten Free on a Shoestring, another of my favorite tried and true bakers. I’ve forgotten why she cooks this way… I think she has a child with wheat allergies, but she makes things everyone will (want to) eat. There isn’t much wiggle room with gluten-free baking, so follow her directions. I used King Arthur GF All Purpose Flour and xanthan gum, which I always have on hand. You can use their Gluten Free Baking Mix too, which has xanthan gum in it. I put my cookie dough in the fridge for 30 minutes, so I could do something else, with great results. While the weather is cool and you want to turn the oven on, these are a perfect treat with tea or coffee. Be prepared to share, but it’s okay with me if you eat them all! Let me know how it goes, I’d love to hear your thoughts or questions. The ginger cookie recipe sounds great! Congratulations on counter space. It does make things like baking a wee bit easier! I agree! Ina Garten ! 100%! So glad you are still enjoying your new home! I’ll try the ginger cookies. Our family has had multiple food intolerance issues, and it really makes it difficult cooking sometimes. My son has had some health issues, and loves ginger. I’ll make these as a treat for him! Thank you! Brenda, My mouth is watering and I need to clean off my counters! Oh yum!!!! Looking forward to trying some of these!